Berkshire are a small black pig with prick ears, white socks, white tip to tail and flash on their face. During the 19th Berkshire pigs became very popular. Berkshire were soon exported to the USA. This trend continued throughout the century and by the end of the 19th century, herds were also established in Australia and New Zealand. Up until the first half of the 20th century, the breed grew in popularity. 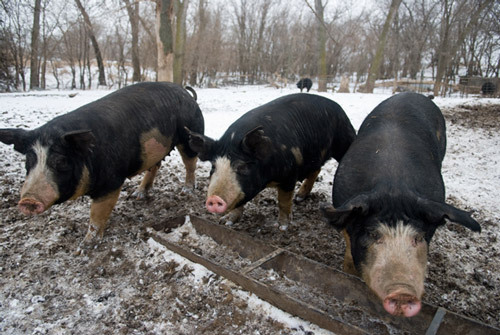 However, as with all colored pig breeds, the Berkshire suffered a serious decline in popularity following World War II when the demand for leaner bacon from white-skinned pigs increased. Since then a number of breeders have developed their own specialized markets for Berkshire pig meat and Berkshire breeding stock are also in demand overseas, especially in Japan, where the breed is very popular and is marketed as Black Pork at a premium price. Japanese buyers still consider Berkshires from Britain to have the best taste and flavor.